The brain areas, such as the cerebral cortex, basal ganglia and cerebellum, play a major role in controlling voluntary movements. On the other hand, malfunctions of these structures result in movement disorders, such as Parkinson’s disease and dystonia. The major goal of our research projects is to elucidate the mechanisms underlying higher motor functions and the pathophysiology of movement disorders. To explore such intricate brain functions, we apply a wide range of neurophysiological and neuroanatomical techniques to rodents and nonhuman primates. 1）Elucidation of information flows through the neuronal networks by electrophysiological and anatomical methods. 2） Understanding the mechanism how the brain controls voluntary movements and higher brain functions by electrophysiological recordings of neuronal activity from animals performing motor tasks, combined with local injection of neuronal blockers, optogenetics or chemogenetics. 3） Elucidation of the pathophysiology of movement disorders by applying electrophysiological methods to animal models. A sagittal section of the mouse brain showing the selective expression of channelrhodopsin-2 (C128S) in striatal projection neurons as visualized by enhanced yellow fluorescent protein signals. 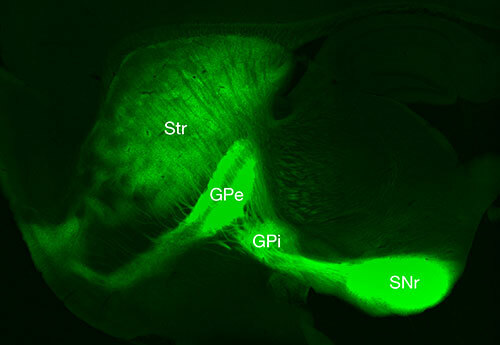 Strong fluorescence was observed in the striatum (Str) as well as the its targets, such as the external (GPe) and internal (GPi) segments of the globus pallidus and the substantia nigra pars reticulata (SNr). 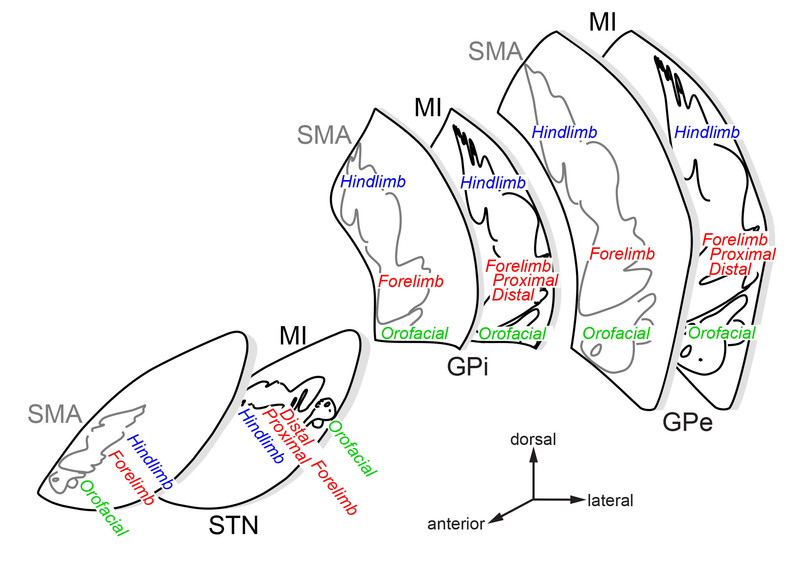 Cortical stimulation of the face, forelimb and hindlimb areas in the motor cortices of monkeys induced responses in the subthalamic nucleus (STN) and the internal (GPi) and external (GPe) segments of the globus pallidus, and revealed somatotopic maps of these structures. These maps contribute to stereotactic surgery for Parkinson’s disease.